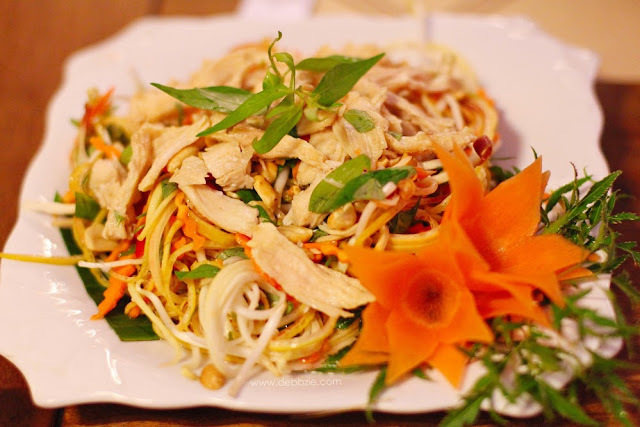 Honestly before visited Vietnam for the first time, I had very limited knowledge about Vietnamese cuisine. I had only tasted Pho, Cha Gio and Bahn Mi which I adore. 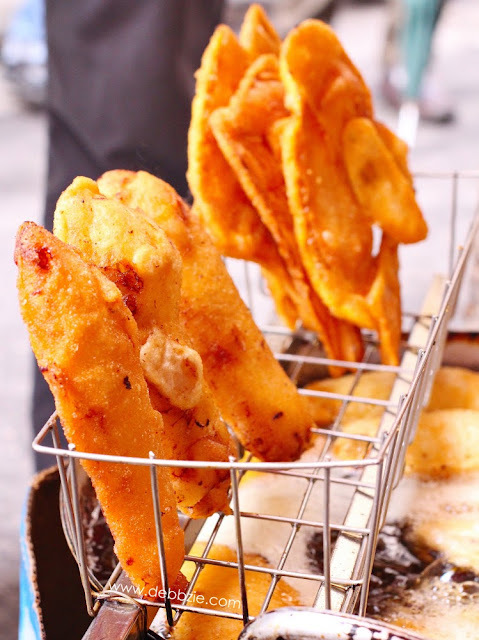 So in order to learn more, I decided to book a private food tour for my family (USD 25 per person). It's always nice to be accompanied by local people and get to know their daily life also the stories behind their food. First stop was fried goodies. Cat, our Hanoi street food tour guide brought us to a small food stall next to St. Joseph's Cathedral. 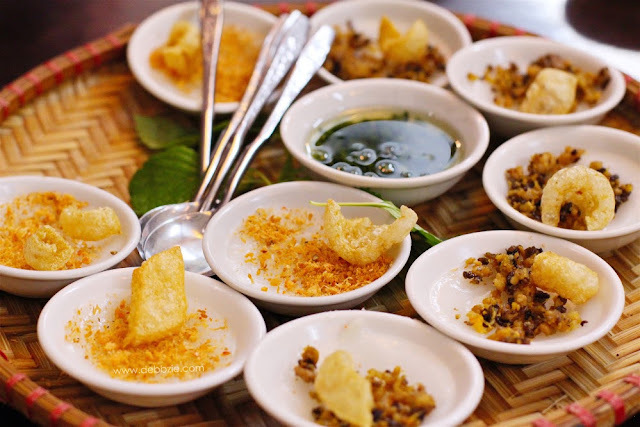 Almost immediately, we were served a mixed platter of Bahn Tom, Cha Gio and Bahn Goi accompanied with a bowl of dipping sauce and a big plate of fresh herb leaves. Bahn Tom is basically a fried shrimp fritters. We have a quite similar dish too in Indonesia which we call Bala-Bala / Heci / Bakwan. I've never heard or tasted Bun Cha before thus I didn't expect much when Cat took me here. I almost skipped it because the eatery was tiny and very packed with people. You know, as a claustrophobic I easily feel overwhelmed in such situation. To make it worse I had to climb very narrow spiral staircase up to the 4th floor attempting to get an empty table. It must be delicious because so many people are willing to queue. Don't you dare to faint before you taste this, Debz! And so I told myself not to give up one of Hanoi's specialities. Thankfully I didn't have to wait long for my food to be served. 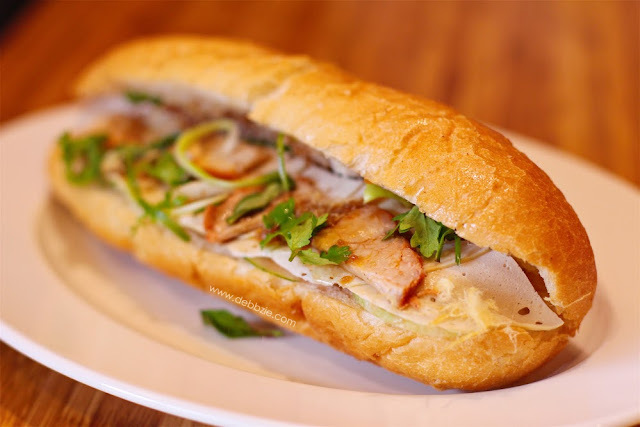 Bun Cha is grilled pork that is served with white rice noodle, fresh herbs and dipping sauce. The appearance reminds me of kebab that I ate in Mostar, Bosnia & Herzegovina. But Bun Cha has a more delightful and sweet aroma of the charcoal grilled meat. I took a bite of those fat golden colour chunk of patty and tasted a sudden glorious sensation on my taste buds. The meat is so moist that its juice dipping down my lips. I closed my eyes and moan unconsciously. D.E.L.I.C.I.O.U.S! It was definitely love at first bite. Known as Vietnamese beef noodle salad, Bun Bo Nam Bo was given a title 'One of the best street food in Hanoi Old Quarter'. 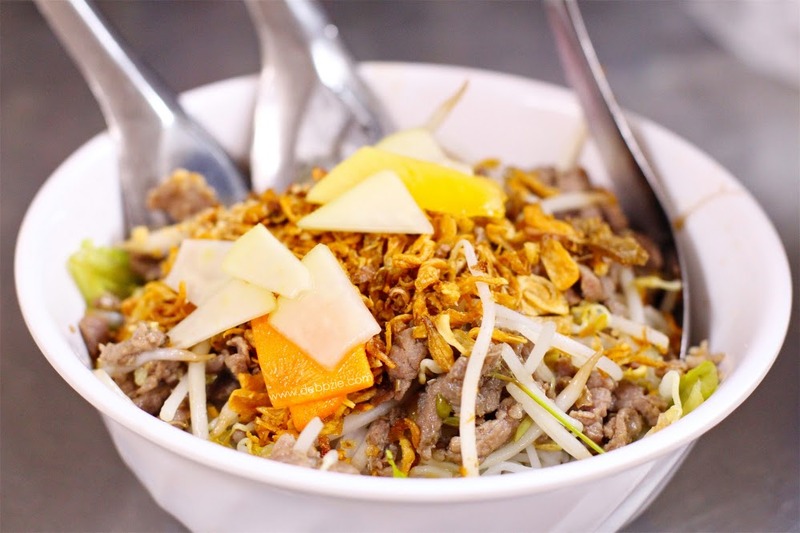 Surely it's a mouthwatering combination of steamed vermicelli, stripped of well marinated - grilled beef, fresh cilantro, bean sprout, fried shallot, lettuce, sliced cucumber, carrot pickle and a spoonful of crushed peanut. I know it's so tempting to digging it right away but it's essential to mix all the item in the bowl first before eating it. I can't agree more with Bobby Chinn's statement: "Textures of contrasting temperatures and flavours with each passing bite makes for a wonderful simple dining experience that is worth the wait as well 20 minute sitting on low uncomfortable bench and or stools." I had fun watching the seller cooking this rolled cake on a special pot with a cotton cloth place on top of it. A very thin layer of batter was poured onto the cloth and evenly spread. It took less than a minute before she lifted the delicate sheet using a bamboo stick. Then she added some seasoned ground pork, minced wood ear mushroom and minced shallot. Not my favourite food but my sister love it. "Would you like to taste this sand worm?" Cat teased me. "Sure, let's go!" I answered, full of excitement. I could tell that Cat was a bit surprised and was expecting to see my facial expression of disgust with a firm "no!" or "ewww" as my reaction. LOL. There's no way I would miss the chance to taste this sand worm since it's pretty rare to find. It can only find in a such short season from end of September to October. We then did what people called 'the Vietnamese squat' on some small low chair while waiting our sand worm to be cooked. 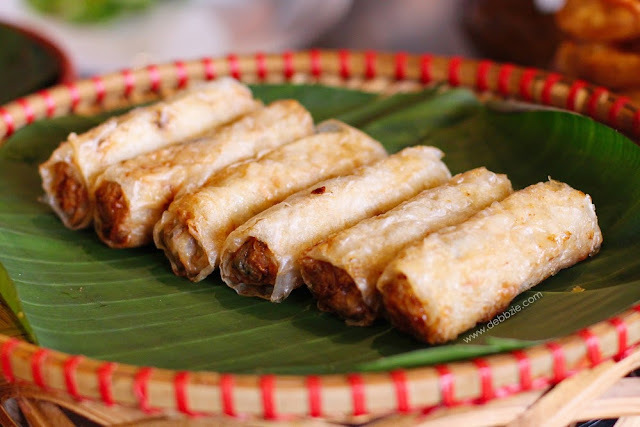 Apparently Cha Ruoi is a special delicacy from Hanoi and North Vietnam. Though it's a bit greasy, I couldn't stop munching. 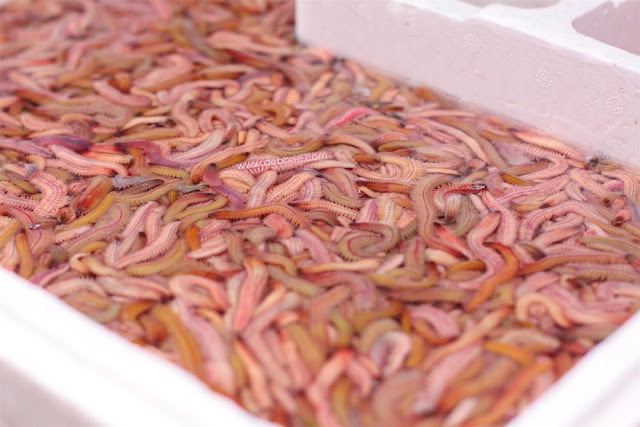 The worm has a very soft texture and blend really well with the batter of eggs, scallions and a hint of pepper. 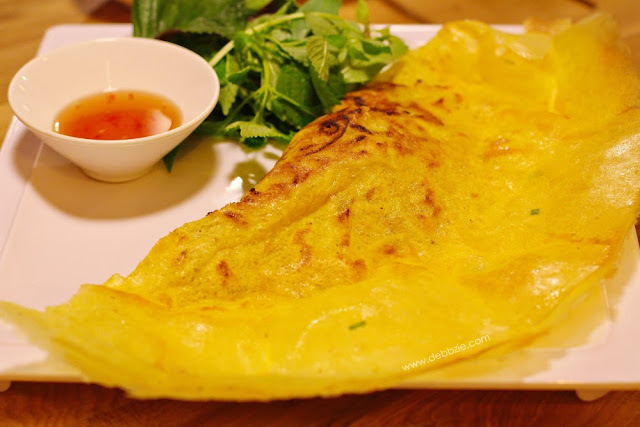 Very tasty omelet! I was also taken to this restaurant that served some authentic food from Hue. 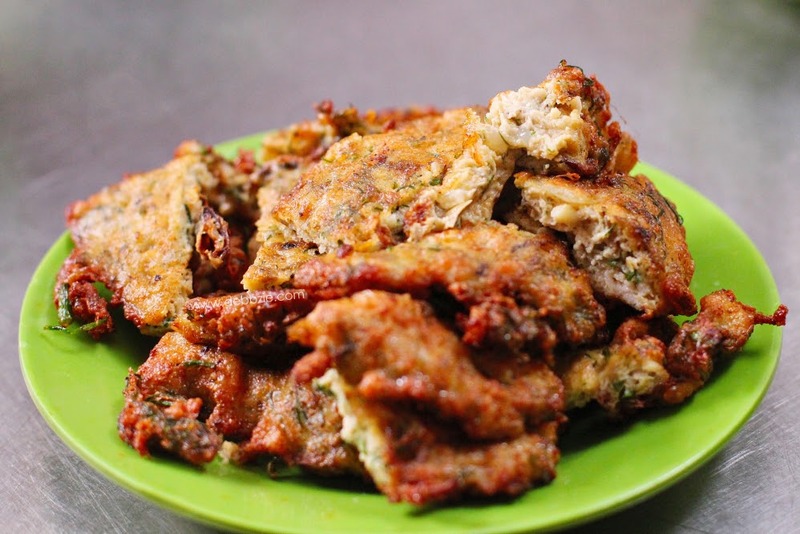 Bahn Beo literally means water fern cake and is the Vietnamese version of tapas. I was excited when the waiter brought me this food. Just look how it's beautifully presented on a traditional bamboo tray. The rice cake batter was steamed on tiny ceramic plate topped with chopped dried shrimp, small bits of crunchy pork and pork crackling. Oh yum! Very tasty and interesting dish indeed. 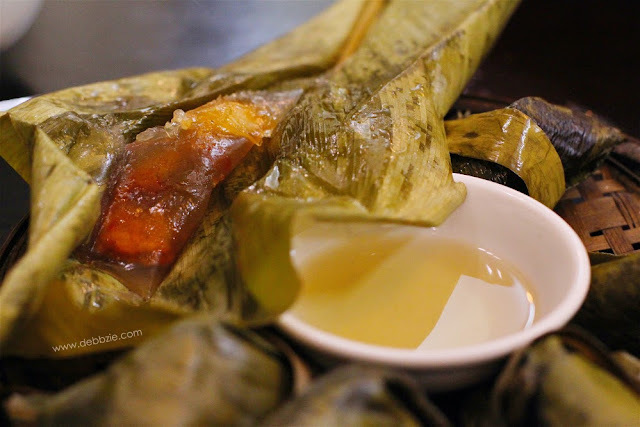 Wrapped in banana leaf, this snack loosely translates to 'clear flour cakes'. It's also originated from Hue, as the city was once the imperial capital of the Nguyen dynasty and known for having simple yet sophisticated dishes. The small clear looking dumpling has a Q factor or bouncy texture from tapioca starch. Somehow it felt like I was chewing gummy bear but a savoury one. 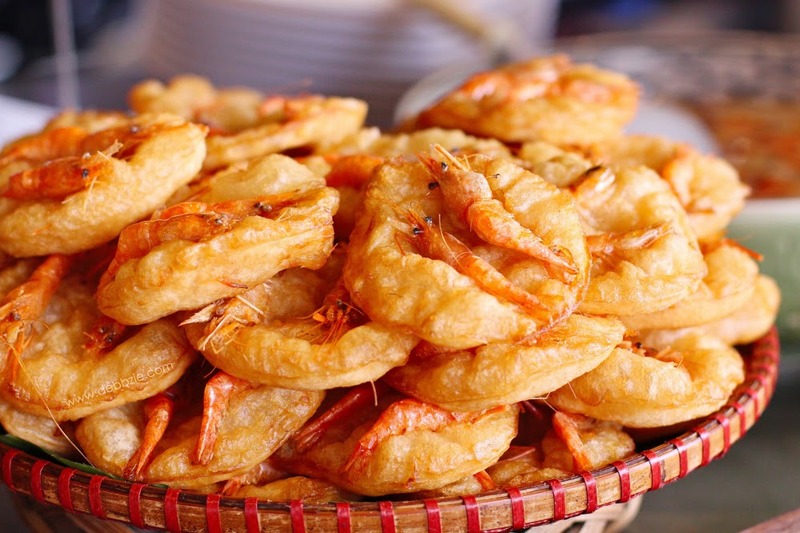 It is filled with shrimp and served with fish sauce that has a combination of sweet and spicy flavour. 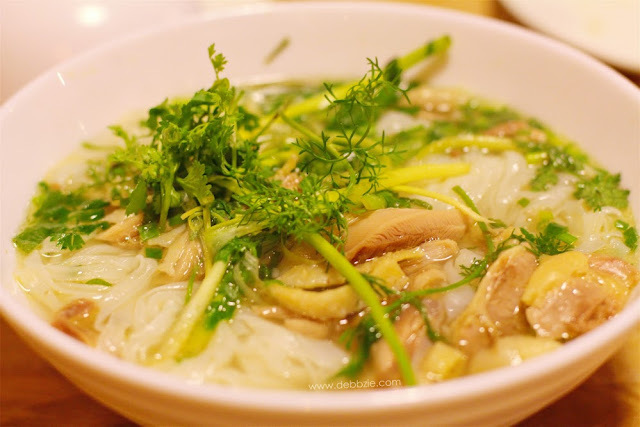 Compare from Pho Bo, this chicken noodle soup has clearer broth which tastes lighter too. Pleasing my sense of taste but I love my Pho Bo more! 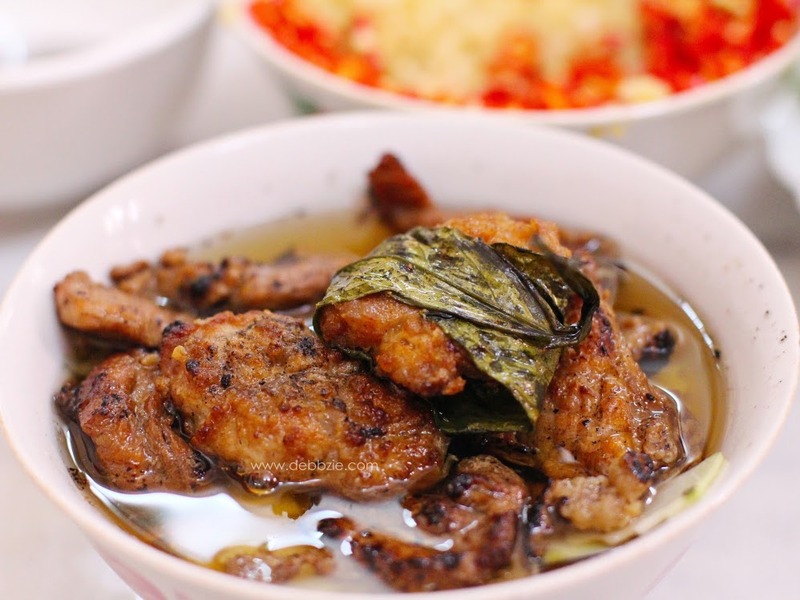 I presume the cooking method for the chicken is similar to Hainanese boiled chicken since they taste quite the same. 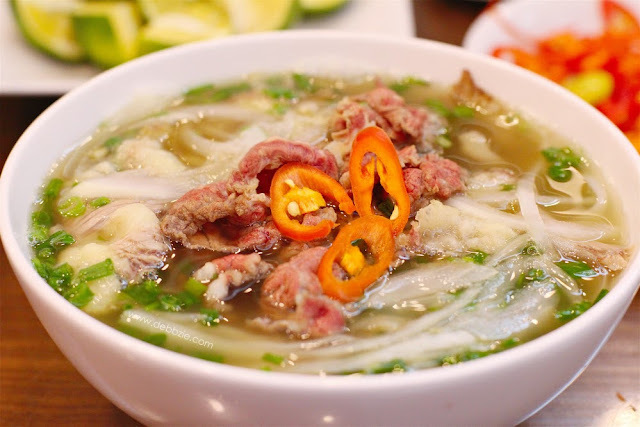 Just like Pho Bo, it's also served with ample of fresh herbs like cilantro, basil, shiso leaf, spearmint and else. My sister and I had just done our shopping in Dong Xuan market and passing through a narrow alley packed with people eating in some food stall. Then I noticed an older lady was selling this vermicelli soup with some escargot on top. I looked at my sister with big grin on my face and she instantly nodding in agreement. The idea of eating snail makes a lot of people cringe but we both love it. Tomato based broth has a perfect tanginess and complement the snails well without overpowering its flavour. Dang! 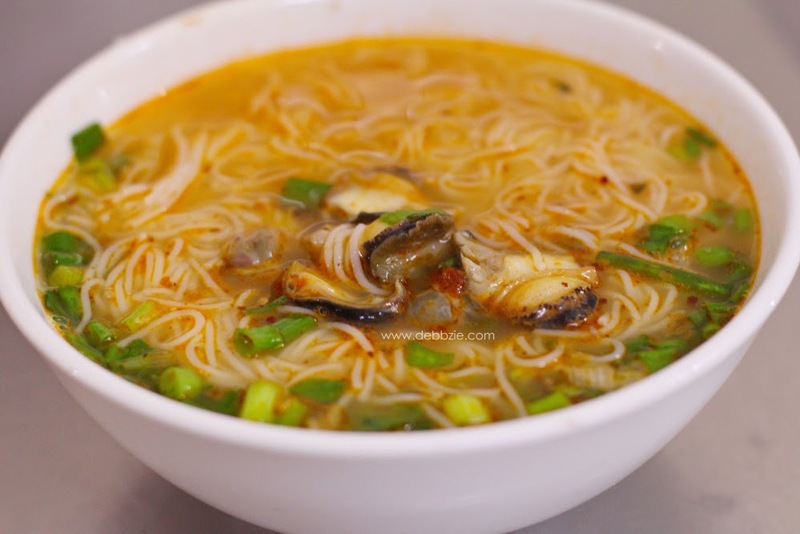 I'm having a sudden crave of this snail noodle soup right now. 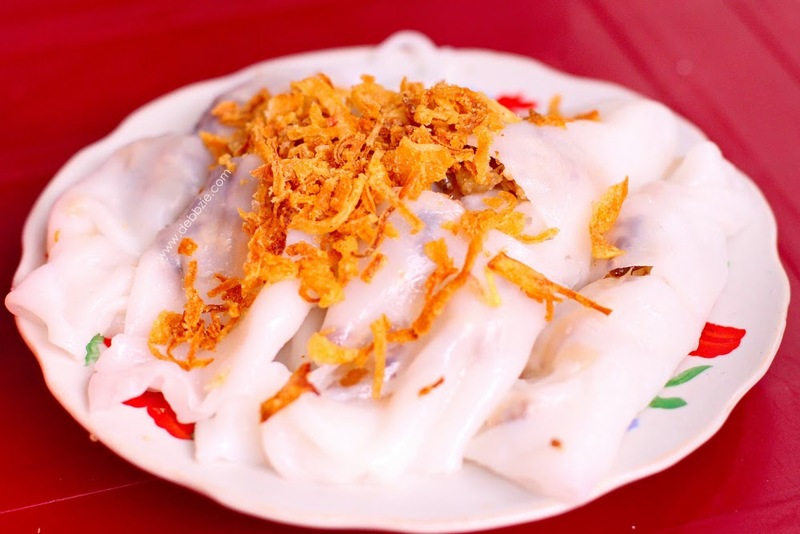 Found this dish when I was exploring Ninh Binh and they said it's the speciality from the province. The mountain goat meat is grilled along with galangal and lemongrass. The tender texture of the meat indicating a great cooking skill. Surprisingly it doesn't have the distinct odours or gamy smell like it normally does. 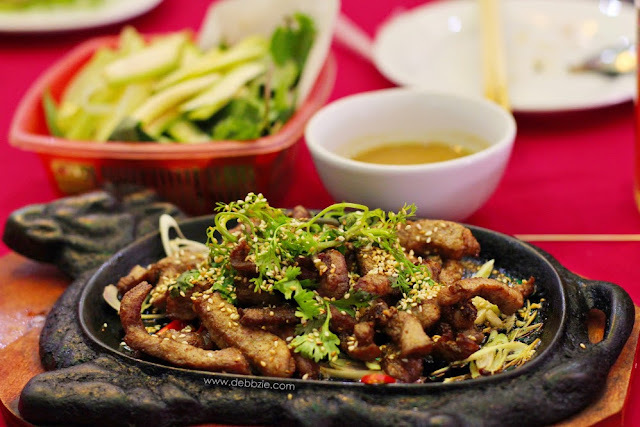 The taste is actually reminds me of black pepper beef that I order in some Chinese restaurant. Surely luscious! 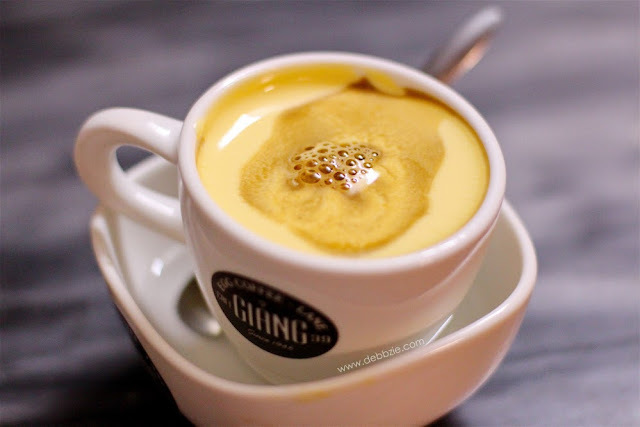 And of course, it would be a shame to leave Vietnam without tasting their famous Vietnamese egg coffee. I did browse before hand because the idea of mixing egg with coffee as a drink sounds a bit odd to me. We went to cafe Giang which is quite difficult to find if I were not with Cat. He ordered a hot egg coffee and an iced egg coffee with chocolate. 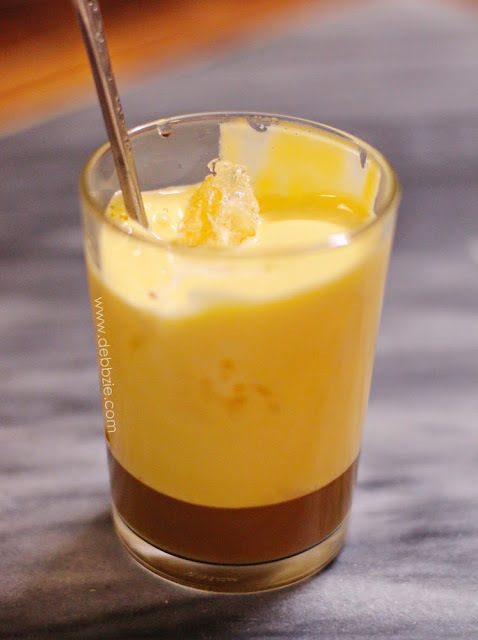 After a very light stir into those creamy layer of whisked egg, I took a sip from my teaspoon. Surprisingly it tasted really good! Something like tiramisu but with a stronger kick of coffee. The iced egg coffee was even better because it's added chocolate. This gotta be my new favourite way to enjoy coffee!